Welcome to part three of the Get Lean & Tone Up series. If you haven't checkout out part 1 & 2 yet.... what are you waiting for??? 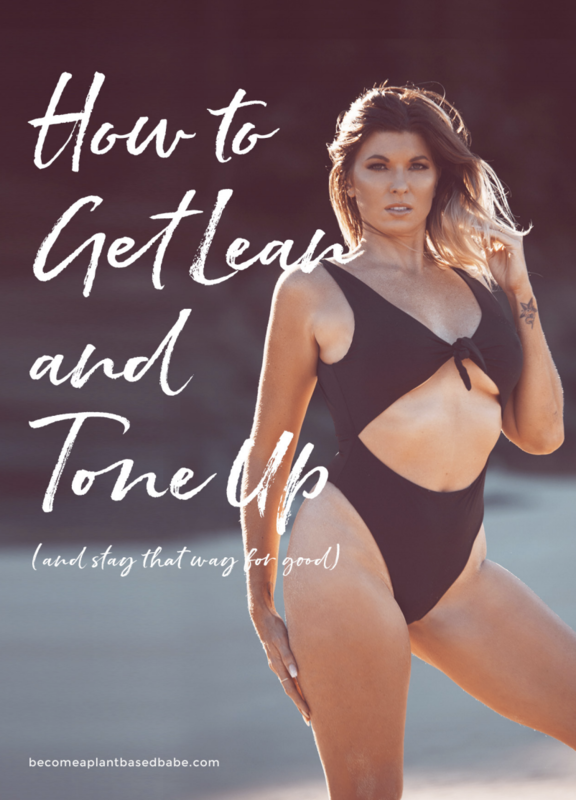 Also.... this dope download is just waiting for you to download it and take action - so you can begin your journey to your bangin' bikini bod! All these tools, these words are no good, unless you take action. If you want to see changes, if you want to see your body transform in a way that you never thought possible for yourself.... you have to push yourself. You have to get out of your own way, step out of your comfort zone and take a leap of faith. Yes, I know that's scary. Yes, I know it's going to be freaking hard. But, I can also tell you that once you get there it will 110% be worth it. I have been through the challenges, I have ridden the roller coaster of weight loss... and I can tell you, once you are out the other side and you know what works for you IT IS SO MUCH EASIER! So how do you figure out what works for you? I did it by trial and error. I didn't get a coach for my initial weight loss journey. If I had, I probably could have shaved 4 months off my initial 9 month weight loss journey. But, I was stubborn and I thought I had all the answers. But you know what, I was determined not to give up ever again... so that method was fine for me. But, if you are stuck in a cycle of starting and stopping, second guessing yourself, or getting shiny objectitus (ie. constantly chopping and changing your diet) then getting a coach, might not be a bad thing. It's like having a roadmap, you just have to turn up and do the work. Plus you have someone to kick your arse if you start to slack off (never underestimate the power of accountability). It's not 100% necessary to have a coach, but it can take the headaches out of the process and constantly trying to figure everything out on your own when you are already busy! But ultimately it will always come down to you. No one will be there to slap the block of chocolate out of your hand as you watch a movie after you put the kids to bed. No one will be there to throw a bucket of cold water over you to get out of bed to go train in the morning. But, feeling like you are disappointing someone, or letting someone down can be a big driver to keeping on track and following through. How often do we go out of our way to do things for other people instead of ourselves? Most women I meet, well it's like 99.9% of them. So having someone checking in with you daily, someone that you want to be successful for, well that can be invaluable to staying on track. Especially while you are forming your new habits and getting yourself set up with your new healthy lifestyle. Think about the results you want. What do you want to look like physically, what do you want to feel like, what can you reasonably fit into your schedule without getting overwhelmed? Ask yourself questions like this. Plan out what you will do. What will your exercise will be each week (make sure it is exercise that will actually allow you to achieve your goals)? What will you eat every day? Do take action. Take action, and reassess at the end of each week. Work out what worked and what didn't and then do again the next week. Then repeat until you reach your goal. You just need to make sure what you are doing aligns with your goals. And you are not secretly sabotaging yourself and setting yourself up for failure from the start. Remember, our bodies are constantly changing and what worked for you when you were 24 won't necessarily work again for you when you are in your mid 30's and so on. So you need to be smart. You need to be adaptive, and you need to be flexible. But just keep taking action! It will be hard, but as I said before... it will be 110% worth it. There is no better project to work on than your health and fitness. The benefits flow over to all areas of your life. I heard the sad story of a guy yesterday who had to rush a sale of his business as he needed a heart operation and he was going to be out of action for over six months. He had worked hard his whole life in spite of his health, not doing anything to keep himself healthy. And now, he was forced to take penny's on the dollar for his business because he was unable to run it because of his ailing health. Not to mention the fact that he may not have much quality of life after his operation. So his whole life has been work. That makes me sad. Life shouldn't just be work then you get sick and you die. So take action, get started. The clock is ticking and you only get one shot at this life. And if you need help to get started, to make massive lifestyle changes.... I am here. I offer both 4 week & 8 week private coaching blocks to help get you lean, help you tone up, look hot & be healthy AF!